Moral philosophy and poststructuralism have long been considered two antithetical enterprises. Moral philosophy is invested in securing norms, whereas poststructuralism attempts to unclench the grip of norms on our lives. Moreover, poststructuralism is often suspected of undoing the possibility of ethical knowledge by emphasizing the unstable, socially constructed nature of our practices and knowledge. 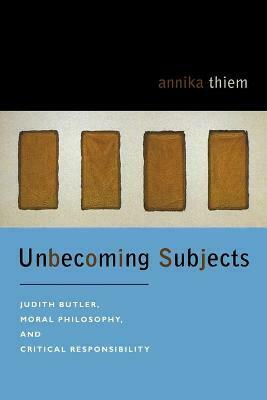 In Unbecoming Subjects, Annika Thiem argues that Judith Butler's work makes possible a productive encounter between moral philosophy and poststructuralism, rethinking responsibility and critique as key concepts at the juncture of ethics and politics. Putting into conversation Butler's earlier and most recent work, Unbecoming Subjects begins by examining how Butler's critique of the subject as nontransparent to itself, formed thoroughly through relations of power and in subjection to norms and social practices, poses a challenge to ethics and ethical agency. The book argues, in conversation with Butler, Levinas, and Laplanche, that responsibility becomes possible only when we do not know what to do or how to respond, yet find ourselves under a demand to respond, and even more, to respond well to others. 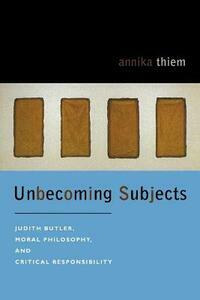 Drawing on the work of Butler, Adorno, and Foucault, Unbecoming Subjects examines critique as a central practice for moral philosophy. It interrogates the limits of moral and political knowledge and probes methods of social criticism to uncover and oppose injustices.